I observed an event today which I have never seen before. I was unsure if I should post the story and the photos on my blog as I normally share only “pretty” pictures but decided that some people might find the situation interesting. 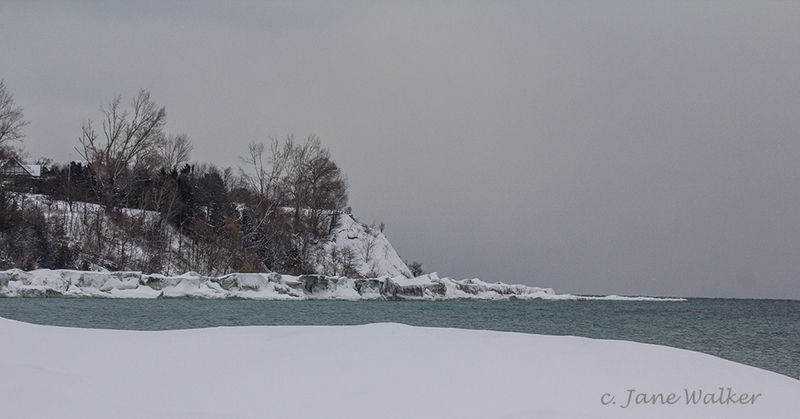 While taking photos today of the many ducks down at Bond Head on the shore of Lake Ontario, I noticed a small furry mammal crawling over the ice shelf on the break wall. It was some distance away from me and across the narrow channel. I decided to move closer and as I did, I noticed that the creature was dragging something which he dropped about 10 feet from the edge. 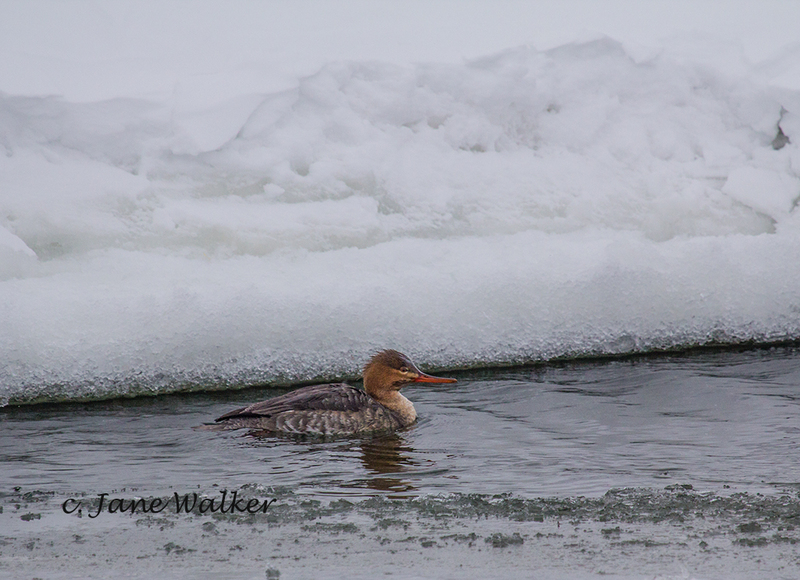 I was shocked to see that it was a merganser and it seemed lifeless. 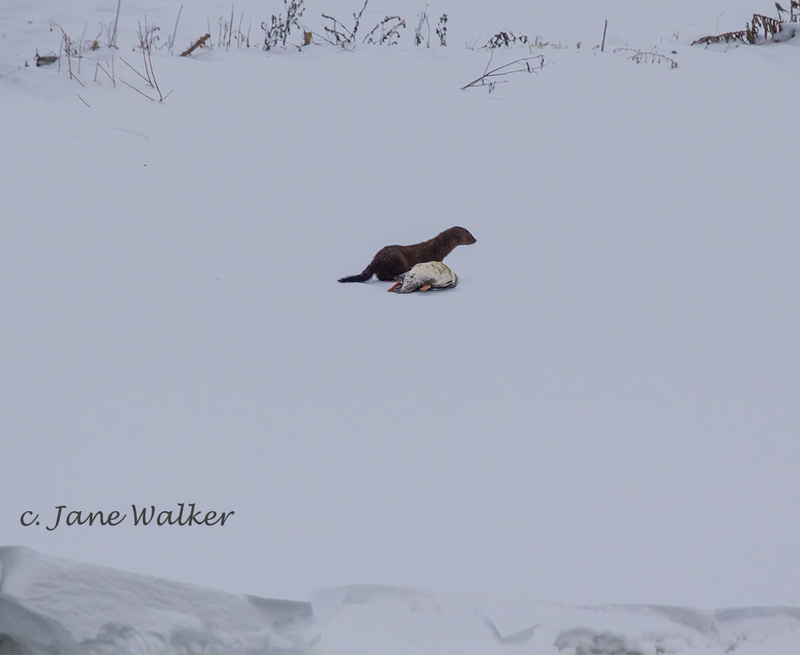 The furry creature came back to the edge of the ice leaving the dead duck behind. He then watched the many ducks below him, perhaps identifying his next victim. 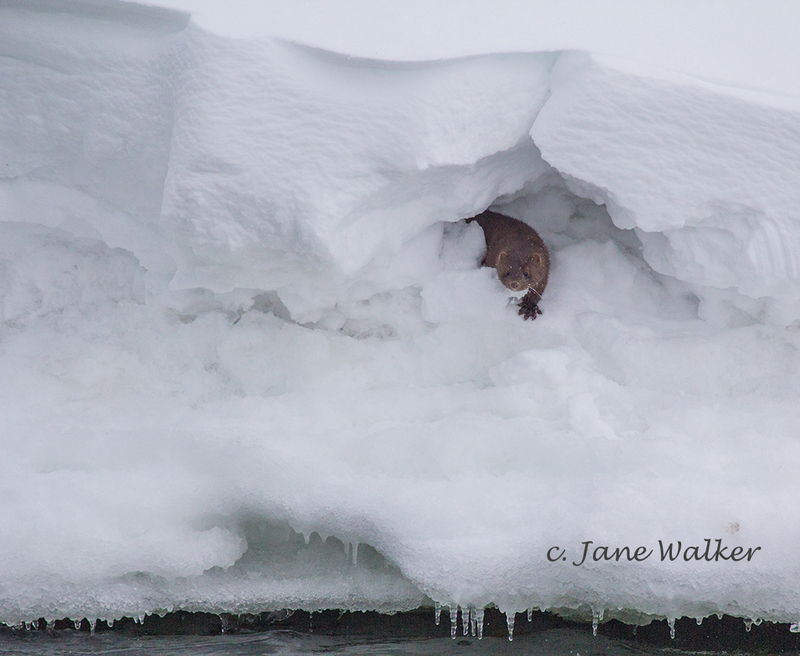 He finally dove into the water but I later spotted him peeking out of hole in the side of the ice shelf. He finally came out of the tunnel, crawled on top of the shelf, and went to retrieve the dead duck. 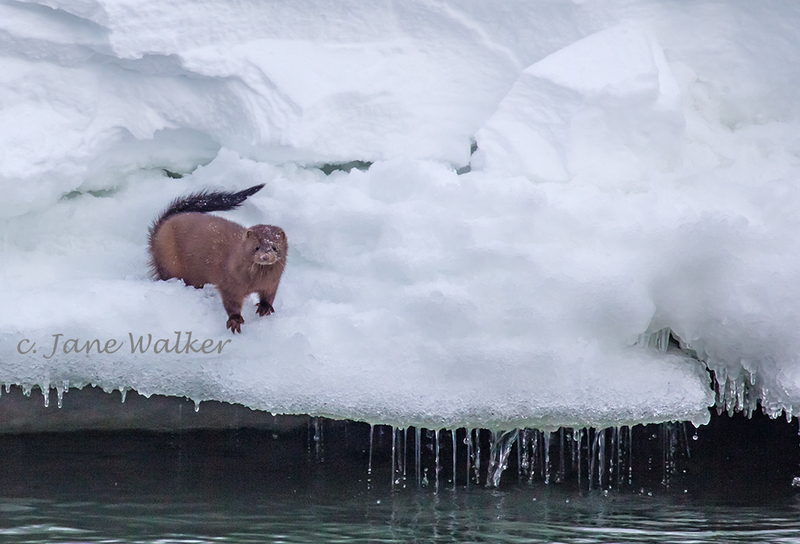 He dragged it to the edge of the ice by it’s neck and then jumped into the water taking the duck below the surface with him. I did not see him resurface. If someone familiar with brown, furry mammals can help me identify this creature, please respond to my blog. 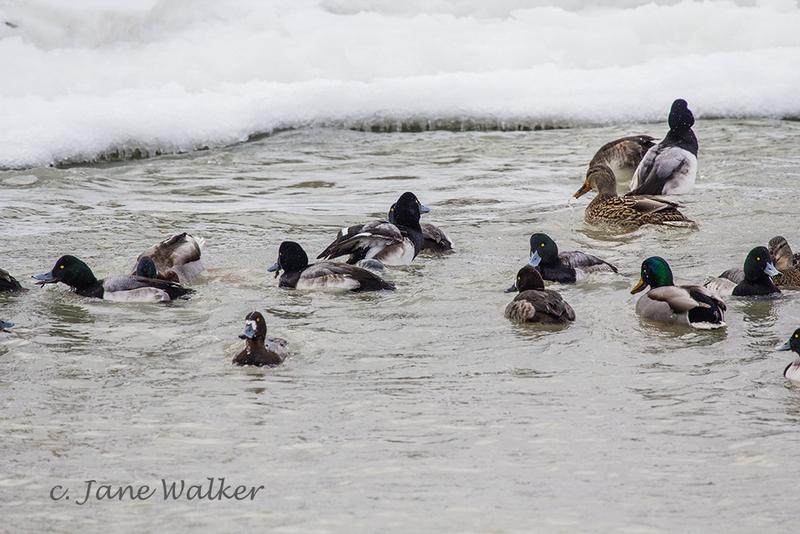 This entry was posted in Uncategorized and tagged bond head, ducks, furry creature, furry mammals, ice on Lake Ontario, Lake Ontario, merganser, nature, Nature Photography, photography, small furry mammal. Bookmark the permalink. Thanks for your input Tim. I don’t think it was large enough to be a fisher, it was more the size of a cat . I couldn’t see a buff patch on the throat and chest but I may have missed it as I was so surprised to see it in the first place. 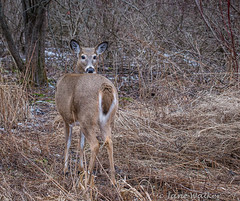 Was out bird watching in the Burlington/Hamilton area with Pickering Naturalists yesterday. Managed to see 42 different species of birds. 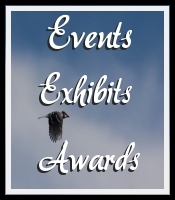 Some pretty cool sitings from Bald eagles to Hawks, Falcons and lots of different waterfowl. Wow Tim. That’s amazing. Can you share some photos? Regarding the ID. of the little creature, seems that it’s a mink. Confirmed by someone who works at the Ministry of Natural Resources and another person who works at the zoo. I guess the mystery has been solved! I think it is a weasel. I don’t know if they like water that much. Thanks, Gayle. Turns out that it’s a mink. It was fun involving people in this post. 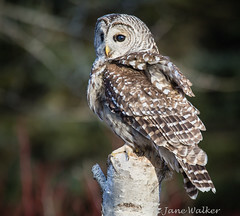 Hello Jane: beautiful series of photos! The beautiful furry critter is a Mink. Hi Daniel…..an interesting series of “true nature”. 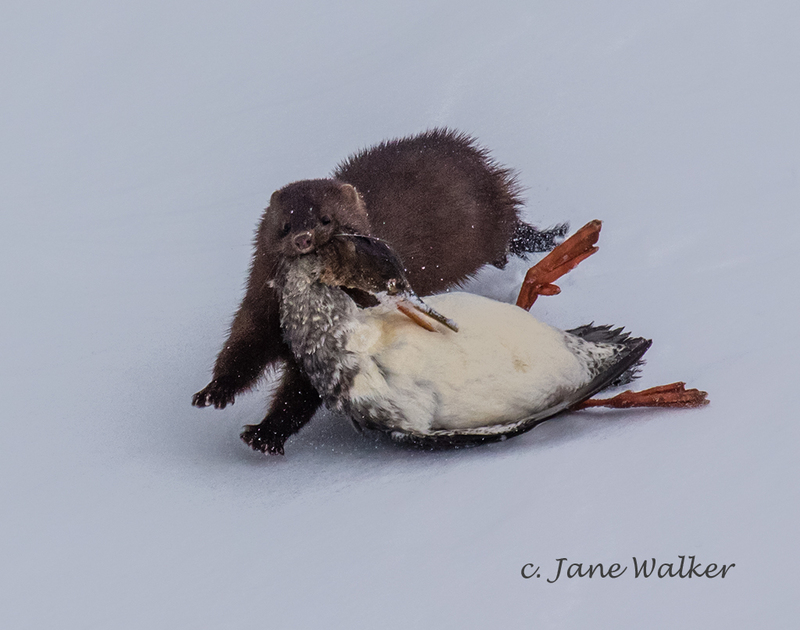 Your mink ID appears to be correct. Thanks Tim for checking. An acquaintance who works for the Ministry of Natural Resources also believes that it’s a mink…..too small for a fisher and a marten apparently is more of a tree dweller who eats red squirrels not ducks. The consensus is that it’s a mink. Great shots! I probably would have said otter, but the mink makes more sense. We sometimes see both out on the ice here, and if they are too far away, it’s difficult to tell. Thanks, Loreen. I had a good look at it but was not sure of what it was at the time. People were pretty helpful and “mink” seems to be the winner. 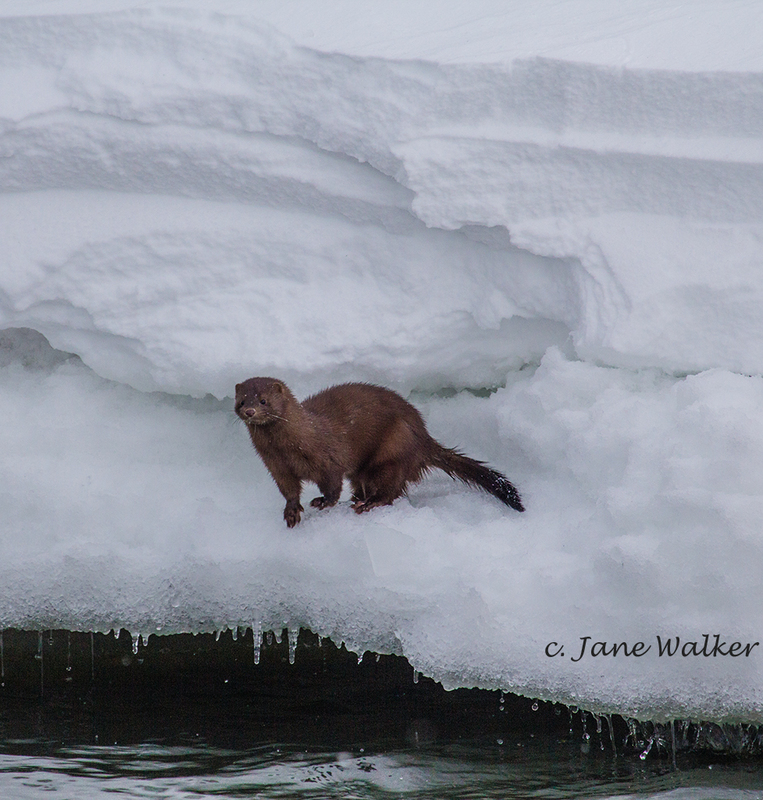 Great shots, Jane! It’s a bonus to be both good & lucky!!! I guess on that day I was both…. thanks! That’s what I said at the time. At first I was horrified but then I thought…”get over it” and take some pictures! 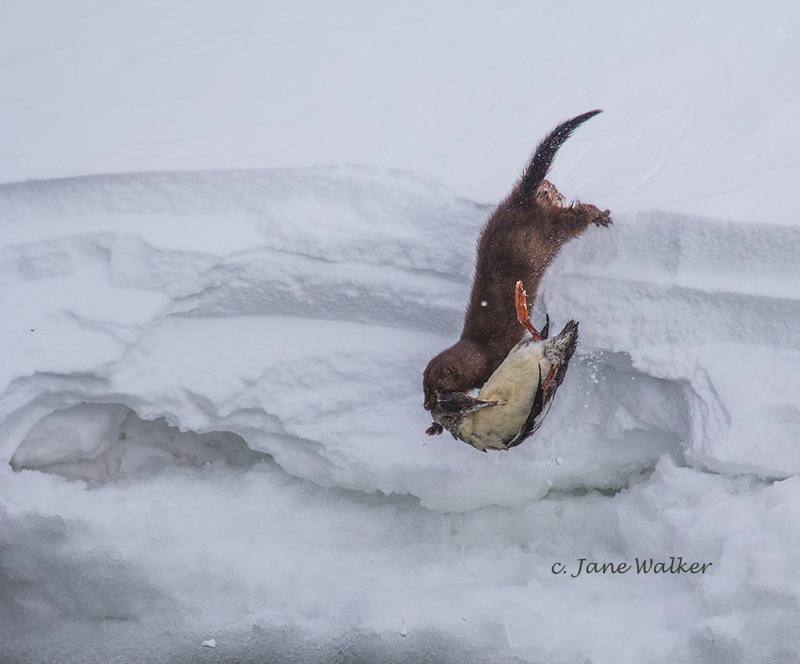 Jane those are amazing pictures, Nature has a way of being beautiful and at times cruel but also reminds us what it takes to survive. I have forwarded your photos to my friends out west. I believe the animal is a Fisher. They are pretty mean little dudes https://www.youtube.com/watch?v=txdoUgli2FQ known to attack anything from foxes, to ducks, house cats. They’re fairly unknown to most. Thanks for your input and the video about the fisher. After seeing it, I’m not sure that what I saw was a fisher. It was quite a bit smaller . I will never know for certain. I’ve been back down to the lake to look for it and saw another dead duck on the ice shelf but no sign of the mink/fisher/marten! 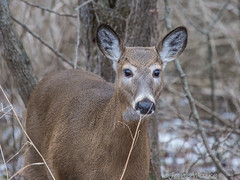 Glad you liked the photos and thanks for sharing my site with friends. I noticed that I have a response from your son, Jarrett. Hopefully I can post some flower pictures soon….when Spring arrives.